For all of us, this holiday season has taken a different turn after the events at Sandy Hook just last Friday. Our hearts reach out to all those impacted there and beyond. If we are truly honest, we know that every teacher, student and family of students in our entire country have been effected. My niece is a high school teacher with 2 children in Kindergarten and second grade. On her Facebook page this past Monday she expressed the pain so well, "For three years I have sent my precious little girls off to school without a single thought of their safety. Never again ... I am just so thankful my district is out for the holidays and I am able to go and volunteer at their school for these next two days to love on as many of our little ones and support their teachers as much as I can." These comments from a teacher and mother 9 states away from the point of the tragedy. There have been many emails from various agencies and organizations reminding people of the existing resources on crisis responses. CASE will be working on making a list of these various websites to place on our website. There are articles included in this issue with various resources. We all need to be as prepared as possible but then recognize that even when prepared, even when doing all you can, bad things can still happen. Thank you all for all you do for so many — students, staff, parents and the community. CASE joined many educational associations as well as some of the leading researchers in the area in signing a joint statement in regards to the recent shooting at Sandy Hook. Click here to view. 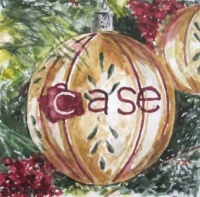 From the CASE office, our President Laurie VanderPloeg, our Executive Committee and Board of Directors, we wish for you a time of family, friends and fellowship ... A time to reflect, refresh and rejuvenate ... A time for thankfulness, talking over coffee or tea, and taking pictures ... but mostly we wish for you wonderful memories — both old ones and hopefully brand new ones, too!